Gōketsuji Ichizoku (aka Power Instinct in the west) is a one-on-one fighting game by Atlus and conversion of their own arcade game originally released in 1993. For 165 years, a tournament has been held to determine who will become the leader of the Gōgetsuji Clan (the Japanese title translates as the 'Gōgetsuji Family'). 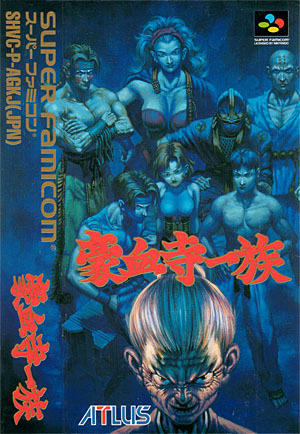 Gōketsuji Ichizoku features eight playable characters : Annie Hamilton, Keith Wayne, Reiji Ooyama, Hattori Saizō, Angela Belti, White Buffalo Thin-nen and the old grand-ma Gōketsuji Otane. The final boss of the game is no one else than Gōketsuji Oume, current leader of the clan and twin sister of Gōketsuji Otane. The game offers elements and controls that will instantly look and feel familiar to any fan of the genre (especially to fans of Capcom's Street Fighter series). Players have an arsenal of moves at their disposal - from weak/strong punches and kicks to special moves activated using traditional quarter and half circles on the D-Pad. The latter can unleash each fighter's true potential, from traditional 'Spiral Kicks' and 'Dragon Punches' to less traditional 'Flying Denture Attacks' and 'transformations'. As expected, this Super Famicom conversion features a couple of extra play modes such as Vs. Battle, Practice Mode, Time Attack, Life Attack and even a Karaoke mode (sadly cut from the American version). This Super Famicom version is surprisingly close to the original arcade game. The conversion was slightly toned down though (the blood was omitted) and fighting arenas were simplified (the arcade game has beautiful and intricate backgrounds). As expected, the American version of the game was also slightly modified from its Japanese counterpart - The Karaoke mode (pictured on the right) and several demo screens were omitted. Also, it looks like all the endings were changed and simplified. 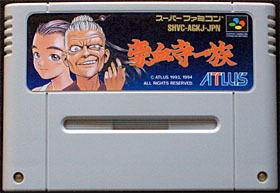 Gōketsuji Ichizoku was originally released in the arcades in 1993 and was ported to Nintendo's Super Famicom (1993) and Sega's Megadrive (1994). The latter has a couple of extra options not found on the Super Famicom version (namely, a Battle Royal and a Character Editor mode). A sequel, called Gōketsuji Ichizoku 2 Chotto Dake Saikyou Densetsu (aka Power Instinct 2) was released in the arcades in 1994. The game featured a grand total of thirteen playable characters and introduced Clara Hananokōji, a sort of magical girl who was later featured in her own isometric shooter Purikura Daisakusen in 1996 (Arcade and Sega's Saturn only). Gōketsuji Ichizoku Gaiden Saikyō Densetsu (aka Power Instinct Legends) followed in 1995 but the game was only an 'upgraded' version of the second opus - the real sequel, called Groove on Fight: Gōketsuji Ichizoku 3 (aka Power Instinct 3 - Groove On Fight) was released in the arcades in 1997. 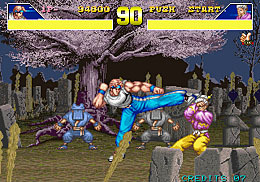 This installment, also available for Sega's Saturn, was a total refurbishment of the original game with a new cast of characters. As a side note, Watanabe Seisakujo (aka Furansu-pan) released in 2002 is a sort of parody of the game titled Glove on Fight, a fun and unique boxing game only available for PC Computers - but the game shares nothing in common with Groove On Fight, except maybe for the name and slick box art. Fans of the series would have to wait until 2003 to see their favorite fighting saga to be resurrected - Matrimelee: Shin Gōketsuji Ichizoku (aka Power Instinct Matrimelee) was released that year for SNK's Neo Geo and for Sony's Playstation 2 (and titled Shin Gōketsuji Ichizoku: Bonnō Kaihō). The first thing that will immediately strike players as different from any other fighting game is the quality and uniqueness of the fighter's portraits and the overall graphic quality of the various illustrations. Renji Murata (aka 'Range Murata') is a Japanese artist known for his subtle, unique and immediately recognizable style. He began his career as a video game illustrator and he is today best known for his work on anime series such as Blue Submarine #6 or Last Exile and series of art books such as Robot. This Family Feud Is To The Death! Control of the third wealthiest family in the world is achieved by defeating all Gogetsu bloodline contenders in a martial arts tournament to the death! Every opponent has studied for years to master their special killing techniques and crushing moves. By entering this tournament, you risk all you have for the ultimate prize - the honor of ruling the Gogetsu Clan. The Gōketsuji Ichizoku series sadly never managed to reach the same level of popularity in the West than it did in the East, and I wonder why. From all the "Street Fighter" wannabees, Gōketsuji Ichizoku was certainly somewhere in the top of the list and its cast of characters definitively stood out. The series brought "weirdness" and "humor" to the genre making it a really unique franchise with strange fighters able to use magic and to sometimes transform... The most memorable characters are probably the old Oume and Otane with their unusual attacks and special powers - especially when they throw their fake teeth at you or turn into young girls. The game has great controls, and double jumps and dashes really add a lot to the gameplay. Other episodes of the series are way better than this one, but don't get me wrong, this conversion is outstanding and the Japanese box-art is truly amazing.